Jeweller's Shop uses local resource of gold, silver, ivory, or amber to provide an extreme boost to the trade as some people not only travel hundreds of miles to bring jewellery from far away land, but also are obsessed by it. Medieval people adored jewelry. Some jewelry had religious meaning and precious stones were looked religiously by some people. Silver was mainly produced in medieval Europe. 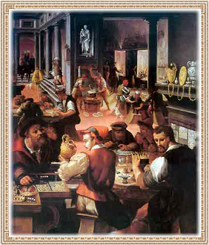 Its production continued steadily throughout the Middle Ages and silver was even used to make coins until gold was introduced in the XIII century in France, England and Italy. Some gold was recycled from older coins and jewels, but the vast majority of the gold used by the goldsmiths came from trade or mining. Both Hungary and Bohemia did provide medieval Europe with a lot of gold which came from mining. Additionally, panning did also happen (looking for gold in a river by filtering other materials) which was mostly done in the Rhine area. Sumptuary Laws in C13th Medieval Europe came into force and capped luxury in dress and jewellery. Townspeople in France, were not allowed to wear girdles or coronals made of pearls, gemstones, gold or silver. Similar laws existed in England. The fact that these laws forbade yeomen and artisans from wearing gold and silver indicates how the status of jewellery and sumptuous dress had become widespread beyond just the nobility.